SCO Expansion: Russia-India-China plus Central Asia? The SCO may become the world’s largest non-Western international organization that can exert a tangible influence on changing the system of international relations, with due account for the interests of the SCO member states, at least its main members. The consolidation of new global political and economic centers cannot be reduced to the basic mechanisms of transferring global power from one region or country to another. Multi-polarity should be viewed as the emergence of new ideas, for instance, the elaboration of a new security concept or the appearance and development of new trends in the world’s socio-economic development. The 21st century began with large projects on establishing new partnerships, communities and integrations. These international “aggregations” are no longer regional organizations, and their formation can be hardly described as “regionalization,” according to the logic that determined the world’s development in previous years. It's clear that the operating international associations, many of which are in crisis, are most likely to reshape their own concepts and modes of operation. For the most part, they will become instruments of such associations. Or else they will join new associations or stop their activities altogether. Naturally, this “moment of truth” will also come for the Shanghai Cooperation Organization (SCO). In the 15 years of its existence, the SCO largely implemented many of the goals formulated in its charter documents, such as ensuring security and combating terrorism, separatism, extremism and other global challenges. It also managed to achieve tangible progress in economic and humanitarian cooperation of its member-countries. Today, the SCO is a recognized international agency and a serious factor in ensuring regional security and stability. This is evident, among other things, in the growing interеst in cooperation with the SCO on the part of some countries in the region and outside it, as well as interstate formations of various types and political orientations. But at the same time it must be admitted that recently, the SCO’s clout regarding the practical results of its activities in various areas is slowly diminishing. It did not fully live up to the expectations. It is necessary to emphasize in this context that the SCO should tailor its concepts, strategy and practical efforts to the rapidly changing international situation. Apparently, the absence of concrete steps in this area may lead to the emergence and spreading of the elements of stagnation and even degradation in its activities. It is already obvious that it cannot always move forward with the necessary dynamics and support. Red tape is not the only reason for this. Unfulfilled agreements are periodically receive a face-lift, and this is already becoming a tradition. All this objectively compels us to draft a new concept for the SCO’s functioning and development and new formulas for its internal institutional structure and cooperation. The SCO’s development strategy adopted in 2015 may be considered the groundwork for drafting a concept on its activities in the rapidly changing world. The SCO’s potential expansion, the halting movement towards which finally leveled off and was made more concrete at the Ufa summit, may create not only quantitative but, most importantly, qualitative prerequisites for the SCO’s useful and profitable modernization. The SCO’s expansion is long overdue. According to its Charter and other regulatory documents, other countries may join the SCO, primarily those with observer status. This is certainly objective process. It may seem strange and even paradoxical to some people, but this is being accelerated by a new global geopolitical alignment, which is already aggravated by various regional conflicts and confrontations, socio-economic crisis, large-scale movement of people and growing claims. Regrettably, the latter are becoming the dominant factor in the world arena. The possible accession of India and Pakistan, and later Iran and other countries, to the SCO as fully-fledged members will launch a new stage in its development. First of all, if the accession takes place, the SCO can claim to have global influence in a number of parameters, which is most likely to get informational incentives and geopolitical resources for consolidating its positions in the United Nations. In this case the SCO may become the world’s largest non-Western international organization that can exert a tangible influence on changing the system of international relations, with due account for the interests of the SCO member states, at least its main members. Secondly, the SCO’s expansion will remove apprehensions on the part of the West, primarily NATO, on its potential transformation into a military-political alliance. These apprehensions have been there from the very beginning. Fears of the SCO’s anti-US orientation will probably disappear as well. Third, the topic of the SCO’s integration will be also closed. Although the SCO was not initially established as an international integration association, many politicians, scientists and experts have spoken about the need for it to switch to its new, integration quality at numerous conferences and symposiums. Fourth, the SCO will be informally closer to BRICS and especially to the RIC format. It is possible to assume that the discussion of its activities will become more intensive and practical at RIC forums. Even if this assumption becomes a reality, it will hardly provoke the formation of the Central Asian faction in the SCO, although the positions of Central Asian states are possibly likely to change. Fifth, India and Pakistan’s accession to the SCO will somewhat consolidate their positions in Central Asia, although there are no grounds to speak about the future redistribution of their roles, or the strengthening or weakening of their Central Asian potential. Russia and China will remain the main and most influential players in Central Asia for a long time. The main issue of India and Pakistan’s entry in the SCO is what they will bring along and what they will lay claim to. The relations of Russia and China with India and Pakistan have different shares of positive, negative and neutral elements. As many diplomats and experts predict, India is a future global giant that is gradually but steadily increasing its political, economic and military influence. For more than 15 years, Delhi has demonstrated impressive economic, scientific and technical achievements. In the last years of the past century, India, as well as Pakistan, became de facto nuclear weapons states. For a long time Pakistan has been at the forefront of the struggle against international terrorism and extremism, but at the same time, it must be admitted that media coverage of this issue is fraught with various ambiguities, sometimes inappropriate, as is the case with many other states. Pakistan’s experience in this area would be very useful for the SCO Regional Counter-Terrorism Structure (RCTS) based in Tashkent. But the most complicated issue linked with India and Pakistan’s accession to the SCO is whether they will carry along the negative burden of bilateral relations they have accumulated over many years. And furthermore, how will they build their relations with other states and international organizations, and how will this affect their SCO membership? A state's entry into an international organization is preceded by an agreement to abide by its rules and standards, to support, without any reservations, its goals, contractual documents and official positions that are often elaborated in the course of protracted talks. 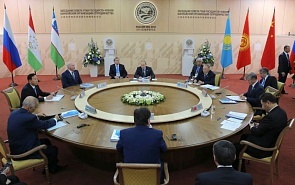 The procedures and rules that govern the SCO’s activities are not too complicated or burdensome. The positions of its members on different international issues, formulated in its declarations, are also understandable and should not bring on any allergic reactions. In making their final decision, Russia and China will proceed based on their national goals and SCO interests, taking into account the complex of problems in the context of their bilateral relations with India and Pakistan. “11. The SCO Member States consistently advocate strict observance of the provisions of Treaty on the Non-Proliferation of Nuclear Weapons, aimed at removing the threat of the proliferation of nuclear weapons, promoting the process of nuclear disarmament in the context of strengthening strategic stability, equal and indivisible security for all and to promote international cooperation in the peaceful use of atomic energy. I’d like to emphasize that the Treaty on a Central Asia Nuclear Weapons-Free Zone is the first and only regional achievement made by the five countries. The preparation, coordination and signing of this document has a complicated history. Understandably, the Central Asian countries value this treaty. Consultations and talks on India and Pakistan’s accession to the SCO have started. Obviously, this won’t be easy, but the process is underway.